Gardner Aerospace will ramp up its sheet metal fabrication capacity with an 800 bar high-pressure fluid cell press from Sweden’s Quintus Technologies. 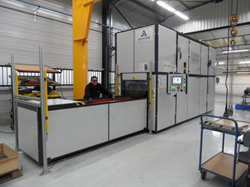 A modern high-pressure fluid cell press from Quintus Technologies will support the Airbus widebody aircraft program at Gardner Aerospace, one of Europe’s largest independent manufacturers of metallic aerospace detailed parts. The new 800 bar (11,600 psi) Flexform press will have a central position at the Gardner facility in Mazères, in southern France, in order to meet Airbus’ capacity ramp-up, chiefly driven by the new A350. Gardner’s Mazères plant is conveniently located close to the Airbus assembly center in Toulouse. The Quintus high-pressure press, with a forming area of 700 mm x 1800 mm (27.6 x 73 inches), will introduce a number of production efficiencies. The hydroform process requires only one rigid tool half, generating significant tool cost savings and eliminating several forming operations, intermediate heat treatments, and operator dependencies. Quintus Technologies specializes in the design, manufacture, installation, and support of high pressure systems for sheet metal forming and densification of advanced materials and critical industrial components. Headquartered in Västerås, Sweden, and represented in 35 countries worldwide, the company is the world leader in high pressure technology and has delivered more than 1,800 systems to customers across the globe within industries such as aerospace, automotive, energy, and medical implants. Read more about Quintus Technologies at http://www.quintustechnologies.com. Gardner Aerospace is one of Europe’s largest independent manufacturers of metallic aerospace detailed parts. Gardner machines, fabricates, and treats small to large and simple to complex detailed parts in soft, hard, and exotic metals. The company also provide kits, sub-assemblies, major assemblies, and repair services. It has a complete range of engineering tools, management processes, and quality approvals to support these capabilities. Employing more than 1,400 people worldwide, Gardner has five modern aerospace approved manufacturing operations in the U.K., four in France, two in Poland, and one in India. Annual revenues exceed $185 million. Read more about the Gardner Group at http://www.gardner-aerospace.com.